The route is quite simple. Starting from the East Mediterranean, we will aim to travel West and will try to stay within the tropics so that we take advantage of the trade winds which blow from East to West year around. For more detailed info, just click on the different regions on the map below. The good thing of traveling West is that we travelling downwind which is the most conformable way to go, mainly with a catamaran, as usually the waves are also in the same direction of the wind and you do not get sprayed all the time. 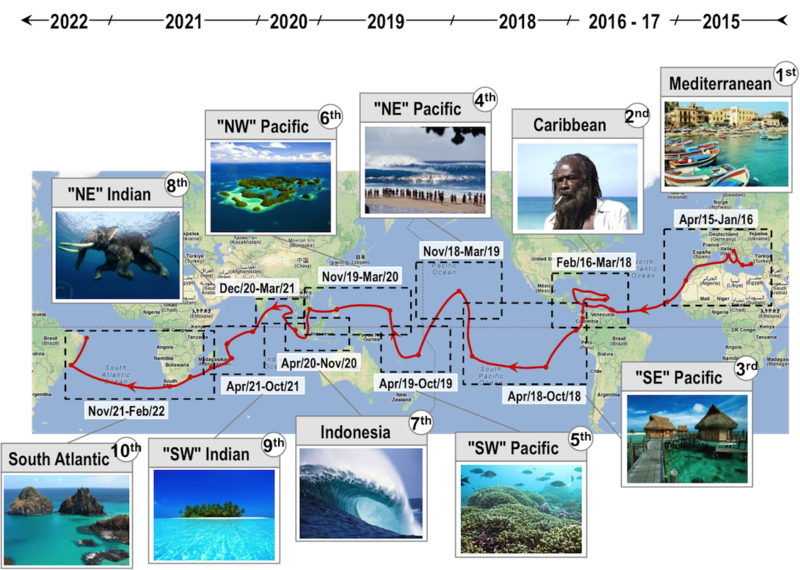 While we will seek to travel west with the trade winds we will also look for the winter seasons within the tropics which usually means better surfing and distance from hurricane and cyclone seasons.